Tuesday, May 29…final preparations…pray for wisdom, for physical rest, for packing, and for stable emotions. Wednesday, May 30…departing NC… processing luggage & flights at RDU airport (high stress time); depart 5:15pm. pray for saying goodbyes, smooth departure from RDU, weighing & checking baggage, calm spirits, wisdom for Team Captains. Also pray for a smooth flight & courage for those afraid of flying. Pray for safety in flight. Pray that we would remember to surrender ourselves completely to His purposes. Pray for ease of connecting the Bethel Hill team with Dave & BeckyLynn in Washington DC. Depart Dulles Airport, Ethiopian Airlines #501 at 8:30pm. This will be about 16 hours on the airplane. Pray for physical discomforts that come with these long flights. Pray for good sleep, good circulation, no leg swellings or aching joints. Pray for that we would trust in Him if He decides to give us these physical ailments, without complaints. Pray for safety in flight & no lost luggage. Thursday, May 31…arriving Ethiopia at 7:00pm. (this is 12:00noon in North Carolina) We will be very tired. We will be met at Bole Airport in Addis Ababa (the capital of Ethiopia) by several Ethiopian ‘sons’ with several vehicles to transport us to the Addis Kidan guesthouse. Pray for ease of clearing customs, that no baggage is lost, that we do not have to pay any additional fees, that visas will be honored, etc. Pray that the Guesthouse will have the beds ready for us, and that we will sleep well. Pray that the loud-speaker prayers of the Muslim and Orthodox will not blast this night, so that we can sleep. Friday, June 1-Saturday, June 2…our first days in Ethiopia. Pray that we will rest in the Lord, trusting that whatever amount of sleep He allows is all we need. We have many logistical errands to run. We will divide into teams of 3-4 people, each team with a list of jobs to do and an Ethiopian guide who speaks good English. This will be the first day of seeing Ethiopia. Pray for the team members as they adjust to the Ethiopian culture & try to absorb all the differences. Pray for safety in travel about the city, staying together, etc. Pray for the Lord’s blessing upon all our errands, that all will be accomplished that needs to be accomplished. Pray for the exchange of our money, that it will be a good rate of exchange. Pray for the translators as they work with Jason on the puppet signs, etc.. Pray for Sheree & Kennon as they visit the places of Sheree’s childhood, that peace & joy will fill her as she sees the Hand of our Lord upon her life. Pray that we will get some rest and adjust to the time change. (Ethiopia is 7 hours ahead of NC). We will visit the National Museum, the King’s Orthodox church and possibly Mt. Entoto to help us understand Ethiopian culture and religious background. From now until we leave Ethiopia, we will eat Ethiopian food almost exclusively; pray for our digestive systems to adjust and for us to exercise wisdom in this area of life; we will drink only bottled water and we will not eat fresh (uncooked) fruits or vegetables. Sunday, June 3…our first Sunday in Ethiopia. We will join a native Ethiopian church for worship services. If we are invited to speak, pray that our Lord will fill us with His message. This will be our last day to rest before heading down-country to Burji. Pray for a good rest time for all of us. Monday, June 4…driving to Soyama Town in the Burji District. We will take a bus; our driver will be Demissie, a church leader from the Alaba Town church, and this will be his bus (he is donating this bus & service for our ministry). It is possible that an additional bus or truck will also help us. Pray for the Lord’s blessing to be upon Demissie for his kindness and generosity to us. Pray for wisdom as we pack the bus/truck with all our suitcases, the motorcycles, the water, etc. Pray for safe-keeping of our valuables that we leave in Addis while we go down-country. Pray for safety as the drivers negotiate the 2-lane road packed with cars, buses, cows, goats/sheep, donkeys, carts, people, etc. We plan to stop along the way to see the Dila Bible School; pray for a good connection with the Dila staff & a profitable time there. Pray for grace as we absorb and adapt to the conditions of rural Ethiopia. Pray for God’s blessing as we begin to forge relationships with Ethiopians; several Ethiopians will be traveling with us on this bus, and we want to be a positive influence upon them for our Lord and His way. Our ‘son’ Bereket (the blind boy) might be coming with us; pray for healing and protection of his eye on the trip (following cataract surgery), and that this time will be extremely profitable spiritually as he is with the Team. This drive will require about 12 hours; we will leave Addis very early in the morning and arrive late afternoon. It is not good to be driving at night; so pray that our trip will be without delaying events, engine trouble, accidents, etc. The first 10 hours will be on a 2-lane paved road, traveling south out of Addis Ababa; this road is called the Pan African Highway since it goes all the way to South Africa. If you have a map, you can travel with us! We will go past the towns of Shashamanee (where Sheree was born), of Awasso, and of Dila, to the town of AgreMariam. This traveling will take us past several large lakes in the Rift Valley, and then up into the mountains, where we will be able to see the tops of Ethiopia’s great mountain ranges to the west. The scenery is gorgeous! At AgreMariam we turn toward the west & drive on a gravel road for 2 hours until we come to Soyama Town. This is the “county seat” of the Burji District. This will be our “home base” for the Burji ministry. We will sleep in the guest house of the church; two people per room. There is a pit toilet hole with cemented floor and electricity. The church ladies will cook meals for us. Pray for us to adjust to the living situation. Tuesday, June 5…our first day in Burji District. Several things will happen today: 1) We will have time with the leaders of the Burji churches to share & get acquainted. 2) Jason E. will formally present the 2 motorcycles for the evangelists of the Burji churches. 3) The Puppet team will do a program for the children of the Soyama Town church. 4) Cindi and BeckyLynn will do an extended session with all the evangelists, SS teachers, youth leaders & Bible School students on the subject of teaching children about the Saviour. 5) Ed will review the laptop computers in preparation for classes. 6) Each team member will meet their personal interpreter and practice working together. 7) We will get oriented to the physical layout of the compound and see the completed Meeting Hall for the first time! During this day, please pray especially for a good connection, person-to-person; this is a new situation for everyone, Ethiopians and Americans alike. The Burji church has never had 11 foreingees (white-faced foreigners) come to them before. They are excited & nervous, and most in our team have never been outside the east coast of America; so they are also excited & nervous. Pray for the Lord to calm hearts & create a bond of understanding and love by His Spirit. Pray also for the Burji leaders and translators, as we connect face-to-face around the schedule, that our Lord will make whatever adjustments are necessary in a spirit of calm and flexibility. Wednesday, June 6 thru Tuesday, June 12…our ministry teams in Soyama Town and the rural villages. During these days, four of us will remain in Soyama Town for their ministries. Ed will teach computers to 12 church leaders. Jason will teach the book of Ephesians to about 110 men; also he will do some leadership workshops for the district leaders. Mary will teach 7 groups of children and 2 groups of women, using crafts along with her Bible lessons. Cindi will assist Mary, do teacher workshops for the government school, and hold English classes for the general public. Both Mary & Cindi will also visit the women of the town in their homes. People will be coming from all around; they will be sleeping on the compound. On the last day, these team members will spend the day visiting a rural village nearby. While they are doing ministry in Soyama Town, the rest of us will be traveling & ministering in 4 villages (3 are predominantly Muslim, one is predominantly animist/witchdoctor /traditional religion). We will spend two days in each village. During our time, Jason H, Danny, Kennon & others will do teaching and the Gospel presentation using puppets in the village square. Kennon & Danny will also use Frisbees & kite flying to draw attention to the puppet scene. Dave will use portrait drawing and guitar music. While this is going on in the village square, Stacy will be doing teacher training and an English workshop in the little village government school, and Sheree will be doing a women’s Bible conference in the rural church. Also, BeckyLynn will test for eyeglasses and distribute prenatal vitamins. In the evening we will show the Jesus Film and give our testimonies at the church. We will sleep on the church floor; the believers of each rural church are making new outhouses for our use, and they will also cook for us. We will travel from village to village in an open-bed truck, walking the distances not possible for the truck, carrying our equipment on our backs. For all members of both teams, please pray for physical strength & health (digestion, sleep, mental acuity, protection from vermin, etc.). Pray that nothing will be lost as we travel from village to village. 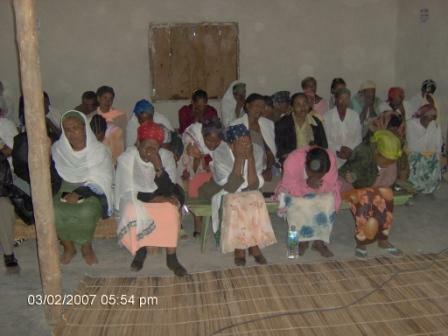 Also, pray for unity of spirit as we work with each other and also with the Ethiopian translators. Pray for our Lord to draw people to Himself thru us, that our testimony of Him and His way would be very clear to the people with whom we come in contact. Pray that Love will be evident. Pray for our translators. Pray for emotional stability in the midst of fatigue, frustrations, adjustments, etc. Most of all, pray that we would be surrendered to the Lord (completely, purposefully, & continually), so that He is free to do His work in His way thru us and in us. Pray the Lord to bind the Evil One, so that His Kingdom can be established thru us. Also pray for Dave, BeckyLynn & Oshe as they provide guidance & logistical support to those doing the ministry. Wednesday, June 13…our last day in Burji, tying up loose ends. This will be our last day in Burji. JasonE, JasonH, Dave & BeckyLynn will meet with the leaders to discuss the future of the Burji churches. Village team members will return from the villages & take their first ‘bath’ in a week. Everyone involved in the ministries will come together for a last time to present gifts and have a special time of testimony. Stacy, Cindi, JasonE, BeckyLynn & Dave will discuss the Soyama Town School project with church leaders. We’ll pack our suitcases, leaving our bed linens for the guesthouse to keep using. Emotions will be running wild. We’ll all be very tired. We’ll be sad to leave, and the Ethiopians will be sad to see us leave. Many last-minute items will pop up. Pray for emotional calm & clear thinking to the end. Pray for wisdom in discussing the future, to know His mind in all things. Pray for physical health & strength and a spirit of unity in the midst of fatigue. Thursday, June 14…leaving Burji. We will leave Soyama Town early in the morning, traveling on the gravel road back to AgreMariam. Then we will join the 2-lane paved Pan African Highway, headed north. We will pass Dila, Awasso and Shashamanee. North of Shashamanee is a town called DebreZeit; this town is the base of the Ethiopian air force. For many decades it also has been the location of the rest home of SIM Mission, which has offered rest to thousands of missionaries coming up from down-country. It sits at the edge of a beautiful volcanic lake. Our Lord willing, we will arrive here in time for a supper of foreignee food. We will sleep in very comfortable surroundings, with hot showers and flush toilets. Pray for safe travel coming up from Burji. Pray for us emotionally as we “let down”. Everyone will process the ending of our trip in a different way. Pray the Lord to give us a restful, restorative night of sleep. Pray for good sleeping, no aching joints & muscles, stomachs to be settled, no swollen feet, etc. Pray for safety in traveling & no lost luggage. Pray for patience and clear thinking. Pray for Jason E and Kennon as the team captain & co-captain. Saturday, June 16…back on USA soil. Arrive Dulles Airport in Washington DC at 8:10am. Go thru Passport Control & Customs. Depart Dulles Airport, United Express flight 7223, at 12:15pm. Arrive in RDU Int’l Airport at 1:21pm. Meet family and friends in the baggage claim or at the curbside. Pray that no luggage is lost. And keep them in prayer as they adjust to life back in the USA. Friday, June 15...After returning to Addis, while the Burji Team is doing shopping, we will do some final logistics (get passports & tickets from safe keeping, confirm flight, etc.). This afternoon we are meeting with individuals, mentoring them in the things of the Lord. Pray for ease of logistics and blessing in communications, especially since we will probably be very tired. Saturday, June 16...This will be a very full day for us. In the morning, we will have an extensive meeting with various leaders about organizing evangelists to reach the North Gondar region with the Gospel; this is hard spiritual soil. Please, please, pray diligently for the Spirit to guide us in knowing His mind on this matter. Pray that we will think of all the aspects and thoroughly discuss the issues. Pray for good communications & understanding between us. In the afternoon, the editor of the largest Christian magazine in Ethiopia will interview us and our (blind) son Bereket. Pray for a clear message of God's grace to be communicated, that His Name will be praised, and that others will be encouraged to live true Christianity. After the interview, we will go to meet a partially paralyzed woman that we have been able to help a little. Pray for a time of spiritual encouragement in the Lord. At 6:00 in the evening, we will have our traditional Family Dinner, when all our Ethiopian children gather with us for a nice meal together. Pray for good fellowship, sweet love, mutual encouragement in the Lord, that He would be glorified in our family. Sunday, June 17...In the morning we will attend an Ethiopian church. In the afternoon and evening, we will have a very special Ring Ceremony for the betrothal of one of our Ethiopian sons. Dave & I will stand in this Ceremony as his parents. Pray for a rich time of communication, for the young couple as they begin their marriage relationship, and for our Lord to be honored in all things. After the ceremony, we will meet the Alaba Team at Bole Airport. Pray for an easy connection with them. Saturday, June 16…departing NC…pray for saying goodbyes, smooth departures from Mecklenburg County, weighing & checking baggage at RDU & Dulles, calm spirits, wisdom for Team Captains Earnie & Carolyn. Also pray for a smooth flight & courage for those afraid of flying. Pray for safety in flight. Pray that we would remember to surrender ourselves completely to His purposes. Pray for ease of connecting the Union Chapel & Tabernacle Baptist groups at the Ethiopian Airlines gate in Washington DC. Depart Dulles Airport, Ethiopian Airlines #501 at 8:30pm. This will be about 16 hours on the airplane. Pray for physical discomforts that come with these long flights. Pray for good sleep, good circulation, no leg swellings or aching joints. Pray for that we would accept & cope with traveling discomforts, without complaints. Pray for safety in flight. Sunday, June 17…arriving Ethiopia at 7:00pm. (this is 12:00noon in Virginia). They will be very tired. Dave & Becky will be meet the Team at Bole Airport in Addis Ababa (the capital of Ethiopia) & take them to the Addis Kidan Guesthouse. Pray for ease of clearing customs, that no baggage is lost, that we do not have to pay any additional fees, that visas will be honored, etc. Pray that the Guesthouse will have the beds ready for us, and that we will sleep well. 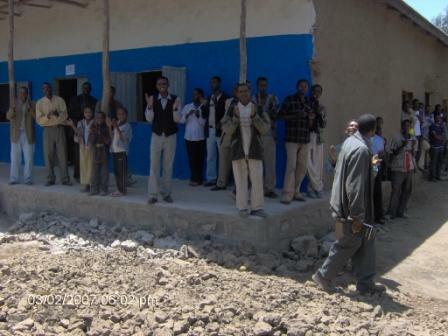 Monday, June 18…the Alaba Team's first day in Ethiopia. Pray that we will rest in the Lord, trusting that whatever amount of sleep He allows is all we need. We may have some logistical errands to run and we will visit the National Museum and the King’s Orthodox church to help us understand Ethiopian culture and religious background. This will be the first day of seeing Ethiopia. Pray for the team members as they adjust to the Ethiopian culture & try to absorb all the differences. Pray for safety in travel about the city, staying together, etc. Pray for the Lord’s blessing upon all our errands, that all will be accomplished that needs to be accomplished. Pray that we will get some rest and adjust to the time change (Ethiopia is 7 hours ahead of VA). From now until we leave Ethiopia, we will eat Ethiopian food almost exclusively; pray for our digestive systems to adjust and for us to exercise wisdom in this area of life. Tuesday, June 19…driving to Alaba Kulito Town in the Alaba District. We will rent a Land Cruiser from the head office of the Kale Heywot fellowship of churches. Pray for the vehicle to operate well, and for there to be no confusion in the rental agreement. Pray for wisdom as we pack the vehicle with all our suitcases, the water, etc. Pray for safe-keeping of our valuables that we leave in Addis while we go down-country. Pray for safety as our driver Markos negotiates the 2-lane road packed with cars, buses, cows, goats/sheep, donkeys, carts, people, etc. Pray for grace as we absorb and adapt to the conditions of rural Ethiopia. Pray for God’s blessing as we begin to forge relationships with Ethiopians; several Ethiopians will be traveling with us, and we want to be a positive influence upon them for our Lord and His way. It is possible that our ‘daughter’ Emebet will be coming with us; pray for her spiritual growth during this trip. Wednesday, Ju ne 20 thru Friday, June 22…phase 1 ministry in Alaba District. For these three days, Gunda & Earnie will go every day to the Keranzo-1 rural church; they will work with Desalegne, Hajji Mohammed and Melese the evangelist. They will have morning and afternoon sessions for the people of this church. Gunda will shape a Bell Choir out of 8-10 people, and Earnie will teach the book of Romans to all the people (maybe 20-40 men & women). Fetiye will cook their noon meal. Sudie & Carolyn will remain in the Town teaching English to school teachers and the general public; they will have morning and afternoon sessions. While their English class is in one room, Dave will be teaching a Bible Conference to the men/leaders/evangelists in another room. Meanwhile, Lloyd & BeckyLynn will travel every day to a different rural church and host a workshop for the local farmers; this workshop is designed as an outreach, helping the farmers understand better about the eco-dynamics of farming; we will do soil testing & distribute seeds. For security reasons, everyone will return to the Town to sleep at night. Pray especially for a good connection, person-to-person; this is a new situation for everyone, Ethiopians and Americans alike. Like the Burji church, the Alaba church has never had so many foreingees (white-faced foreigners) come to them before. I'm not sure who is more excited: the Ethiopians or the Alaba Team members! Pray for the Lord to calm hearts & create a bond of understanding and love by His Spirit. Pray for us as we mingle the Gospel message with English lessons & farm instruction, that our Lord will touch the Muslims attending these classes. Pray also for the Alaba leaders and translators, as we connect face-to-face around the schedule, that our Lord will make whatever adjustments are necessary in a spirit of calm and flexibility. Pray for a super-natural opening of the hearts of the Muslim people to our presence and His love. Pray for just the right people to come to our events, so that long-term, deep-rooted spiritual growth can take place. We are not looking for large numbers; we are looking for meaningful encounters. Saturday, June 23…a change of pace. Earnie will join Lloyd to go to the rural church for the farming workshop. Carolyn, Sudie & BeckyLynn will do some training for those who work with children (Sunday School, evangelists, etc.) Gunda will teach a women's Bible class. In the evening we will show the Jesus Film at the Keranzo-1 church. Pray for the blessing of the Lord Jesus upon our work. Pray for spiritual & physical refreshment this day. Pray for protection from the Evil One during the Jesus Film, so that many will come to the Saviour. Sunday, June 24…Graduation & worshipping with the people. In the morning, Dave will speak at the graduation exercises of the little Alaba Bible School. In the afternoon, Gunda, Earnie & Lloyd will return to Keranzo one last time to worship with the people; they will have a last meal with Fetiye and Hajji Mohammed in their home. 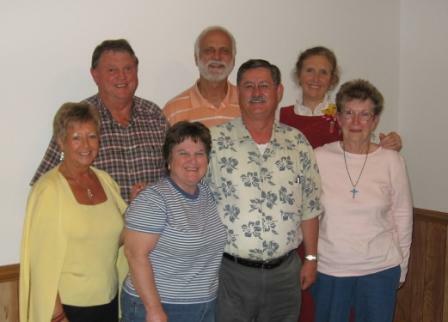 And Sudie, Carolyn, Dave & BeckyLynn will worship with the Bedene congregation, share a meal with them, and then show the Jesus Film in the evening at the church. By now the word would have spread that we are in the District. Pray for physical & spiritual safety on this day of worship, and for logistics of getting everyone to the right place on time for ministry. Most of all, pray that we would be surrendered to the Lord Jesus (completely, purposefully, & continually), so that He is free to do His work in His way thru us and in us. Pray the Lord to bind the Evil One, so that His Kingdom can be established thru us. Monday, June 25 thru Tuesday, June 26…phase 2 ministry. Carolyn & Sudie will do home-to-home visitation of ladies in Alaba Town, then they will have an all-day Women’s Bible Conference. They will teach the book of Ruth. Pray for good communication, good attendance, the free working of the Holy Spirit and stamina. … Lloyd & BeckyLynn will continue to visit rural churches and do farming workshops. Continue to pray for strength & good communication. 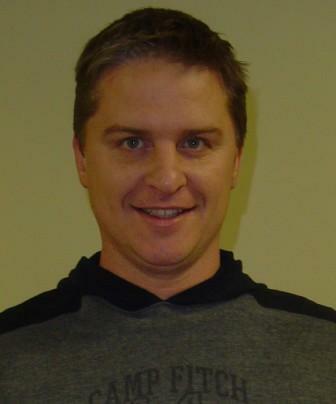 … Dave will work with the Bible Translation Team and/or have a Prayer Ministry with the evangelists & church leaders. Pray for good working relationships and the free flowing of the Holy Spirit in doing His work. …Gunda will develop a Bell Choir at the Zobechame rural church while Earnie teaches the book of Romans to the Zobechame believers. Pray for stamina. Pray for receptivity and organization. By this time, we will be getting very tired. Please pray for physical strength & health (digestion, sleep, mental acuity, protection from vermin/mosquitoes, etc.). Pray that nothing will be lost as we travel from village to village. Also, pray for unity of spirit as we work with each other and also with the Ethiopian translators. Pray for our Lord to draw people to Himself thru us, that our testimony of Him and His way would be very clear to the people we come in contact with. Pray that Love will be evident. Pray for emotional stability in the midst of fatigue, frustrations, adjustments, etc. Also pray for Dave, BeckyLynn, David & Nigussie as they provide guidance & logistical support to those doing the ministry. Pray that we will be flexible without being negligent. We will also have a last meeting with the Alaba leaders. Deep friendships will have been forged. Pray for wisdom in discussing the future, to know His mind in all things. Everyone involved in the ministries will come together for a last time to present gifts, look at pictures and have a special time of testimony. Wednesday, June 27…leaving Alaba. This will be our last day in Alaba. Emotions will be running wild. We’ll all be very tired. We’ll be sad to leave, and the Ethiopians will be sad to see us leave. Many last-minute items will pop up. Pray for emotional calm & clear thinking to the end. Pray for physical health & strength and a spirit of unity in the midst of fatigue. We’ll leave Alaba Town mid-morning & drive the 6 hours back to Addis. Pray for safe travel. Pray for us emotionally as we “let down" & digest what God has done in & thru us. Pray the Lord to give us a restful, restorative night of sleep back in Addis Ababa. We’ll be back to hot showers & flush toilets. Thursday, June 28…saying Goodbye to Ethiopia. In the morning we will gather for a sort of “debriefing” share time after breakfast, then we will have time for everyone to do some shopping, run errands and rest for the return flight. We will also get our items from safe keeping and finalize the finances of the trip. Pray for clear thinking and safe travel as we finish up our business things. We will meet for a last Ethiopian meal at 5:00, then be at the Bole Airport in Addis no later than 7:30pm. (which is 12:30pm in Virginia). After getting boarding passes & checking the luggage all the way, the Team will go thru passport control and security checks. Then go to the gate for Ethiopian Airlines, flight 500. We’ll walk, exercise, visit the restrooms, and prepare for the long flight back to NC. Boarding will start about 9:45pm (2:45pm VA time), departure is at 10:15pm (3:15pm VA time). Due to the rotation of the earth and the wind currents, the flight back is longer than the flight going. So we will be about 18 hours on the airplane. Remember to do the hourly leg exercises & walk about. Pray for good sleeping, no aching joints & muscles, stomachs to be settled, no swollen feet, etc. Pray for safety in traveling. Pray for patience and clear thinking. Pray that no luggage is lost or stolen. We will be very tired; pray for strength. Friday, June 29…back on USA soil. We arrive Dulles Airport in Washington DC at 8:10am. We will go thru Passport Control as US citizens, collect our checked baggage & go thru customs; Carolyn & Sudie will meet their husbands to drive back to Mecklenburg County. The rest of us will then re-submit our checked baggage for transport to Raleigh Durham. We’ll proceed to the USAirways terminal for flight 6283 and depart Dulles Airport at 10:40am. We’ll arrive in Charlotte at 11:57am, and depart on USAirways flt 1179 at 12:58pm. Arrival in RDU Int’l Airport is at 1:50pm. Meet family and friends in the baggage claim or at the curbside. Rejoice together over God’s faithful provision for all that was needed, and for His mercy in calling us to Himself and allowing us the privilege of bearing His Name in the nations. And continue to live a life of surrender to the One who loves us and has redeemed us. May the Gospel expand! !